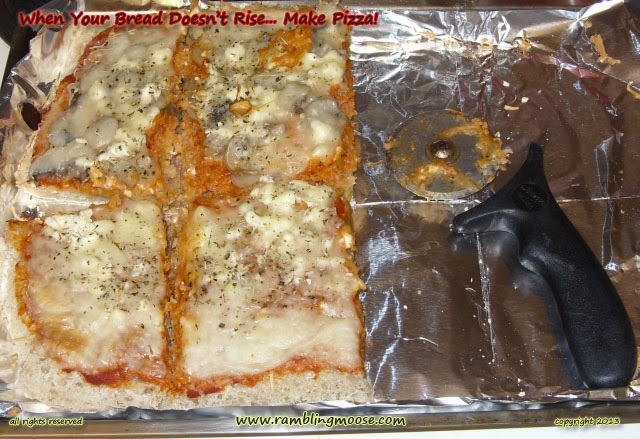 Rambling Moose: When Your Bread Doesn't Rise... Make Pizza! Ok, I may be too impatient to get either, but I do get some pretty good results. Lately I've been looking online for an extremely basic recipe. Four ingredients - Flour, Water, Yeast, and Salt. Not even Sugar. The simpler the recipe, the easier it will be to control the results. Or so the theory goes, right? The problem is that this recipe was billed as the "Super Sticky Dough". When I made it, it turned out more like Pancake Batter. Make your dough, let it rise for up to 20 hours to allow the little critters - your Yeast, to create Carbon Dioxide and digest the natural sugars in the dough. Then bake at 375 for 20 minutes or until done. Ok, did all that. I still ended up with what Kevin called "The Splat". So this will forever be the Splat Recipe, even after I figure it out. The pizza was tasty, but the dough was heavy and over "hydrated". Simply put, it was too wet. 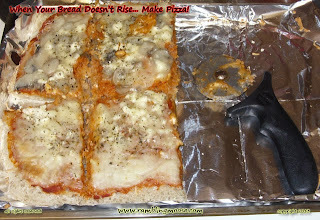 I tried it later with less water and it made a nice firm crust with a Foccacia bread texture. Chewy and full of nice big holes. So this recipe comes with an advisory - you may end up with a splat. Here is the list of ingredients - and I adjusted the water for you to get a Foccacia style loaf. Reduce it more to around 1 to 1 1/4 cups to get a more firm dough. 1 1/2 teaspoon of salt. Mix everything together until smooth. I suggest a stand mixer with a dough hook. Place dough on parchment paper in a warm place like an oven with the door closed. If you rise in a bowl, you will have a more traditional Boule, on a cookie sheet it will spread out because of the high Hydration levels. Allow to rise for a long time - overnight. I went for 20 hours. Bake the next day at 375 for 20 to 30 minutes until golden. If you get a Splat, add pizza sauce, cheeses and other toppings. Reduce the water and try again.